What Lutherans mean when they refer to ‘The Word alone’ | The Old Adam Lives! This is a worthwhile listen with a lot of theological and historical information on the Lutheran understanding of ‘The Word…alone’. If anyone can correctly identify the Roman Catholic Cardinal that Luther goes over the book of Romans with (mentioned by Pastor Mark in the class), they will win a free lunch with me (oh goodie)..on the pier at the Fisherman restaurant in San Clemente, CA. (whenever you are in town). No foolin’. You must spell his name correctly in your answer (as if I know how to spell it, myself). And thanks to flicker and johntestsgo, and arthistory390, for the photos. Thomas Cajetan (pronounced Ca-‘je-tan), also known as Gaetanus, commonly Tommaso de Vio. But I live in San Francisco, so can do lunch somewhere in between? You have a lunch coming to you. I can’t remember the last time I was further North than Ventura…but if you get down this way, towards Orange County…or if I get up around the Bay area, I’d love to sahre a lunch with you and shoot the breeze. Send me an e-mail at sma9231961@aol.com, (if you would) and then I’ll have yours. Thanks for listening to the class and the expanded info. on Thomas Cajetan. PS – I received an e-mail from Pastor Mark saying that he actually misspoke when he mentioned Cajetan. 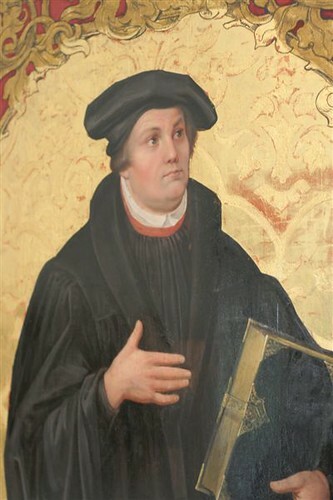 He meant to say Johann von Staupitz, Luther’s confessor priest, and good friend who was the vicar of the Augustinian Monestary at the University of Wittenberg.